We got a peek at the 2019 Mercedes A-Class in hatchback form earlier this year, but the U.S. market car will be sedan only. I’m still excited about it, because based on this batch of photos, it seems like a damn fine-looking little car. It’s a reserved design, but it’s sharp and clean. I think a set of retro monoblock wheels would look cooler than the split five-spokes we see here, but I suppose I’ll wait to find out how good the thing is to drive before I start fantasizing about modifications. Our man Justin Westbrook is at the A-Class launch event in New York as I write this, so I’m sure he’ll have some first-person perspective for you soon. But for now, we can just enjoy the company’s media album from this Mercedes press release. The American market A-Class range will include the A220 and a A220 4MATIC, both of which will run a 2.0-liter inline four-cylinder turbocharged engine rated to a modest 188 horsepower and 221 lb-ft of torque. A seven-speed dual-clutch automatic will be the only transmission option. That’s not a whole lot of get up and go, but the four-banger doesn’t have too much car to move, either. Mercedes says that the 2019 A-Class is 179.1 inches long with a 107.4-inch wheelbase, 70.7 inches wide and 56.9 inches tall. The CLA, Merc’s most diminutive sedan in the U.S. until today, is just a hair bigger at 182.3 inches long. Pricing hasn’t been confirmed yet, and I don’t see a hit-dealerships date either, but I’d expect this vehicle to cost a little less than a comparably equipped CLA, which starts at about $33,000 these days. 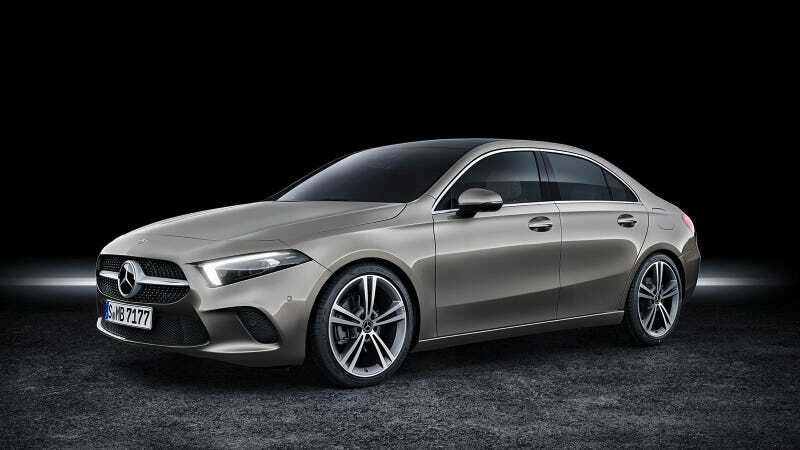 It doesn’t look like the U.S. will get an A-Class that’s quite as lean as the base model in Europe, but this will now effectively be the cheapest route to brand new Mercedes ownership. Based on pictures of the A-Class alone, I love it. Here’s hoping it drives as well as it looks and that there’s a V8 AMG version on the horizon. I mean, it’d probably be a V6 if anything, but a boy can dream. Apparently more details on the 2019 A-Class will be announced at the Paris Motor Show in October.